Want a sneak peak into why I wrote Critical Decisions? Take a look at this 5 minute video. Feel free to send links to all your friends, so they won’t fall behind the times! 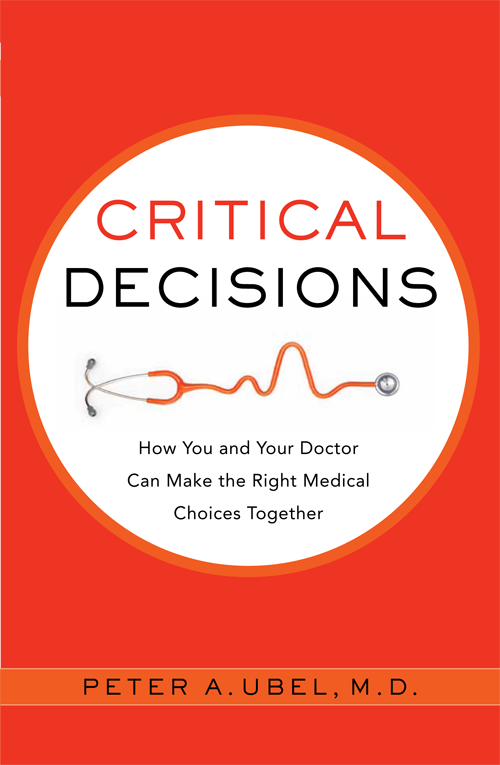 Here is a short video introducing one of the themes of Critical Decisions: the challenge of making shared decision making when physicians unwittingly deluge their patients with too much jargon laden information. In this two-minute video, I explained why it can be hazardous to take a guess at what your lifetime risk is of experiencing cancer. I describe a study I conducted with, among others, Angie Fagerlin. This is one of my favorite studies, because it is really counterintuitive and raises important questions for health communication and medical decision-making. I had the pleasure of discussing the book with Tavis Smiley. We had some fun back and forth, while still covering some pretty fundamental ground about how to help patients participate more actively in their medical decisions.